Mountains are the classical landscape paintings, I would say. It is very pleasing to paint them and not only that, it is pleasing to view them as well. And they are the most common painting subjects for the beginners and amateur painters like me. This is the most satisfying watercolor painting of mountain I have ever made. The painting is simple and effective. The roughness makes it look beautiful rather than spoiling the painting and that is what I always wanted my paintings to be like: leaving back the roughness and carelessness without leaving the awkwardness! The trick to this is to withdraw yourself from painting when that 'correcting' instinct starts coming to your mind. The painting will look good in overall and you'll see the areas where you make mistakes so that you can avoid them next time! This is second painting of mountain in a unique mood and setting, that is, the period just after the rain. This one was done within under 15 minutes of time in a rough and quick style. 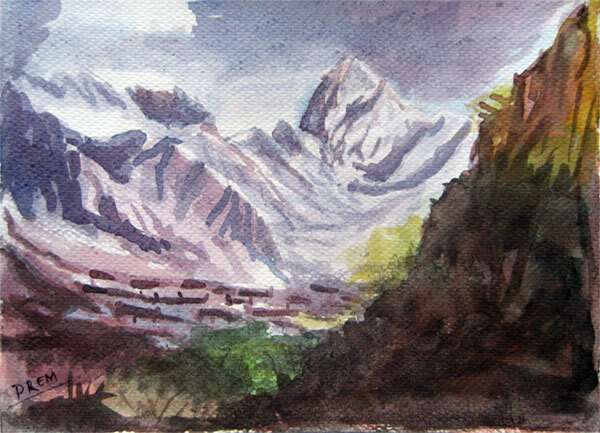 Because of the simplicity of the scene, and small size of the cartridge it was possible to paint this mountain quickly. 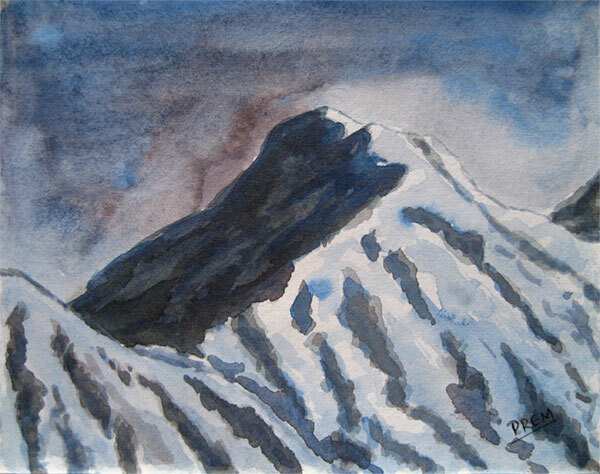 This watercolor painting is the most detailed one among the mountain paintings here. 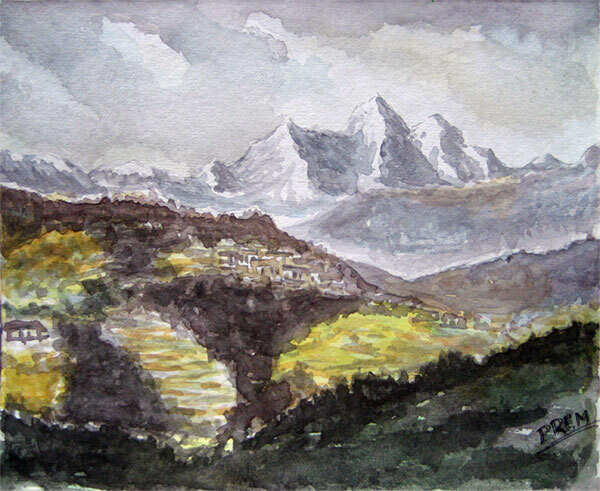 The painting is composed of not only mountains but much more things like the hills with villages, forests, and so on. Therefore, this painting is more realistic and representative of the real landscape. This painting made me understand the real power of watercolor. The details presented in this painting were neither carefully thought of, nor painted with due attention. However, the details have come out well and that's the specialty of this painting. which is only possible with watercolors. The colors somehow come to fit the scene with watercolor paints!